1.A beach bag! Might sound obvious but really it is VITAL to your holiday. I big bag such as a straw bag or my personal favourite a trusty Goyard (which is waterproof) is so useful as you can throw EVERYTHING in there and when you have a child its doubly important. Nannacay have some really cute ones. 2. Sunglasses. The shortcut to always looking chic on a holiday is to invest in a good pair of sunglasses. Most of you know how obsessed I am with Illesteva. I’ve never met someone they didn’t suit. 4. Sandals/Wedges. I LIVE in wedges when I am on holiday especially in the evening as I like to add a little height. People often think I am really tall from my photos but I am really not so keep my flat sandals solely for the day. 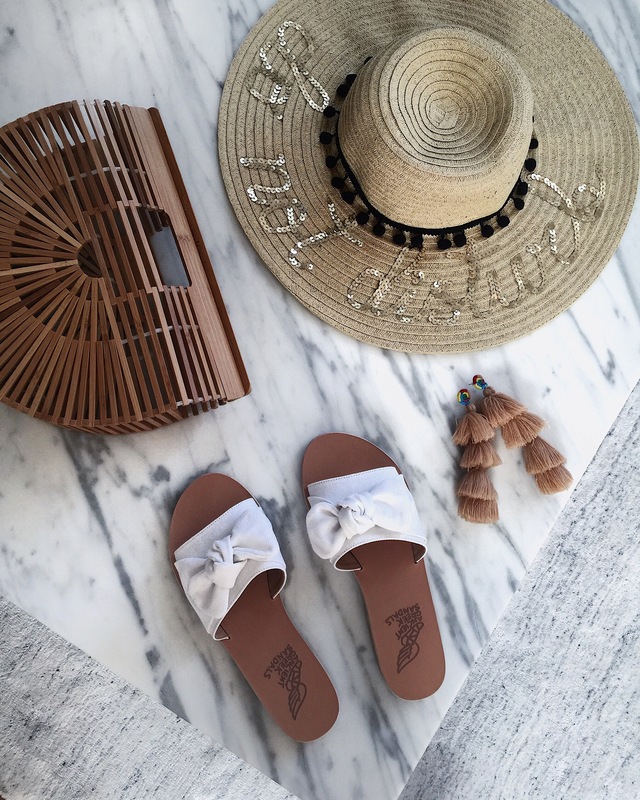 All you really need is one or two pairs of sandals and one pair of wedges (we all know that shoes take up so much space in the suitcase and you never end up using all of them.) Castaner offer some which are reasonably priced and very comfortable. And you all know my love for the Hermes Oran. 5. A little black dress as well as a little white dress for evenings out. Self Portrait is always great as is The Outnet for discounted designer finds! 6. A few beach coverups/day dresses. Pampelone is one of my favourites. 8. A clutch to wear in the evenings. Accessorize is a great high street brand to look at. 10. A bright coloured lipstick. Its amazing what a bright red or coral lip can do to an outfit. Love NARS and MAC. 11. And finally a long cardigan which you can use both on the plane and during evenings if it does get chilly.